Doctor Hector P. García was a Mexican immigrant who changed the lives of millions of Americans and whose positive contributions will continue to be enjoyed generation after generation. Cecilia García Akers gives us special access to this Civil Rights Hero through her book The Inspiring Life of Texan Héctor P. García. Cecilia, daughter of Dr. Hector P. García, provides us with intimate conversations, pictures and memories of the man who fought against segregation, marginalization, xenophobia, and won. Dr. Hector P. García was the first person of Mexican heritage to: graduate from the University of Texas Medical Branch, be appointed Ambassador to the United Nations by an American president and to receive the prestigious Presidential Medal of Freedom. He was also the first U.S. representative to speak before the United Nations in another language other than English and the founder of the American G. I. Forum. Making this book part of our personal library is important, not only by remembering and paying homage to the legacy of this Civil Rights Hero and his contributions to our country, but because its intimate writing style by his daughter invites us to feel closer to this larger than life super human by reminding us that he too was a son and a father. Cecilia makes Dr. Hector P. García accessible in a way only a daughter can, by reminding us that he too was human. It might just be the invitation and inspiration that our next Latino Civil Rights Hero needs. Cecilia García Akers is the daughter of Civil Rights leader Dr. Hector P. García. Cecilia is the current President of the Dr. Hector P. García Memorial Foundation and a Physical Therapist. 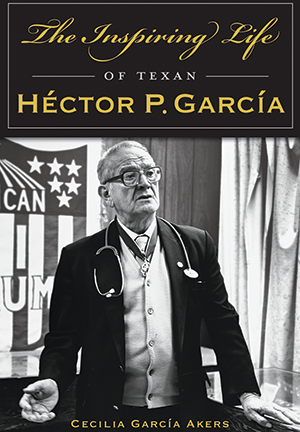 The Inspiring Life of Texan Héctor P. García is a publication by Arcadia Publishing and can be purchased online. Click here to purchase.